Today’s post is our sixth look at robo-advisors and ready-made portfolios. Today we’re going to look at the new offering from Vanguard, and what it should be compared to. Most of you will have heard by now that Vanguard has launched its direct platform in the UK. This was announced last year but is finally here. You can find the new platform here. A similar platform existed previously with a minimum contribution level of £100K, but the new minimum is £500. There’s also a monthly option which starts at £100 per lunar cycle. The direct platform has been running in the US for some time, and has stolen a lot of market share. Over in the states it’s free, but here there’s an annual charge of 0.15% pa on the first £250K. That means that the “platform” fees1 are capped at £375K. 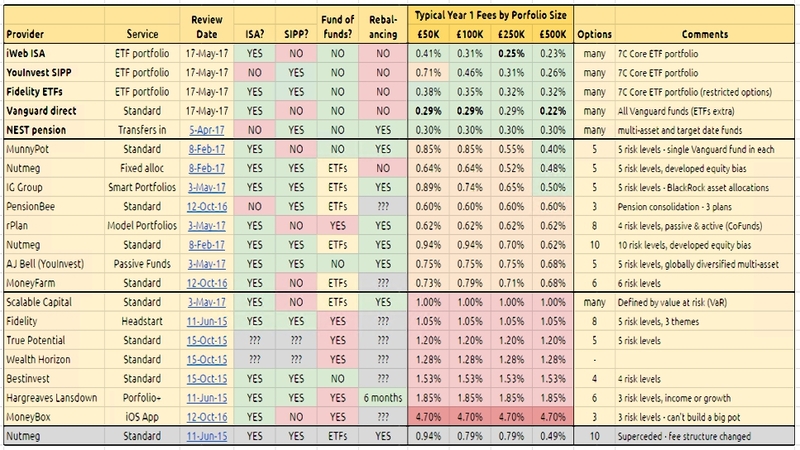 Popular Vanguard funds cost between 0.08% pa and 0.22% pa.
Vanguard quote an average fee of 0.14%, giving a total cost of 0.29% (on the first £250K). There are no dealing charges for funds but ETFs costs £7.50. Interestingly, the 0.29% fee puts them just below the NEST pension platform (for transfers) which we discussed here. The service is ISA only at the moment, but a SIPP offering is expected later this year. It seems that transfers in from ISAs opened in previous years will be allowed. The immediate industry reaction was that the new platform would eat into the market share of leaders like Hargreaves Lansdown. The HL platform charge for funds is 0.45%, which is triple the Vanguard fee. In a rational world, that might be expected to be the case, but cheaper options have been available for some years now. I was at a focus group for an investment firm last night, and most of the other eight investors around the table brought up HL unprompted at every stage of the discussion. The real comparators for the new Vanguard service are those ISAs and SIPPs that allow access to ETFs (and investment trusts, but they are more expensive) for a fixed annual fee. We’ll need to include HL as well, as their popularity makes them an industry standard for charges. The core 7 Circles diversified ETF portfolio includes 15 ETFs with a weighted average charge of 0.21%. iWeb charge nothing for an ISA, and £180 on a SIPP. The table above summarises these numbers. I will also take this opportunity to add the NEST pension platform to the table. The key point is that these five offerings (iWeb, YouInvest, Fidelity, Vanguard and NEST) make up the Premier League of platforms on which to invest your money. It will be interesting to see how long this situation persists. You can find the live table – and links to all of the review articles – here. Really good summary thank you. My isa and sipp are with Interactive Investor which also offer fixed price fees competitively and so I wondered if they will form part of this review? Interactive investor (iii) charge £20 a quarter for an ISA, and £10 a trade. The first year charges for our ETF portfolio would be £210 (we save £20 on the trades in the first quarter). That makes iii more expensive than iWeb and YouInvest, though just below HL. For a SIPP, there’s an extra “admin” charge of £96 pa, so the iii SIPP would cost £306 in year one. That’s again less than HL but more than iWeb and YouInvest. So iii won’t make it on to the final table as there are cheaper options for both ISAs and SIPPs. The debate about platform charges is interesting especially in relation to HL- but I think what is not always appreciated is that HL provide a range of services that other cheaper platforms do not. For example HL provide a pretty cheap (£1 transaction fee) way to reinvest income in new units/shares but other platforms like Bestinvest and now Vanguard do not provide any such service for investment trusts and ETFs- as one of the drivers of total return is reinvestment of dividends this is important. I am with HL, Bestinvest, Charles Stanley and Fidelity, and the higher charge for HL is in my book well worth it -they also are one of the limitedplatforms that have an app to allow you to trade on the go -Alliance Trust, Barclays, Bestinvest, Halifax for example provide no such service. If I could find another provider that could match HL’s customer service at a lower cost I would use them as my major platform but the others are all lacking in one area or more of customer service. There’s no doubting the services (or the customer service) – the question is whether they / it are worth paying for. It’s true that you should re-invest dividends but that doesn’t have to mean drip-feeding the money back into the same stock. I manage my portfolio top down, and dividends just add to the cash level. When that’s too high I invest again. I think trading on the go is a pretty bad idea, and it’s almost worth paying higher charges to avoid such an app. Costs are one of the few areas that are under the control of the investor, and if you pay too much you are impacting your returns. Fair point but I think especially for the small investor regular reinvestment of dividends is crucial and the fact that a provider such as HL or Fidelity offer that either free or at a minimal cost is I think something that should be taken into account as a key service. Often as investors we can fall into the trap of saying that we will reinvest our cash when often you can get put off by high prices or “now is not the time”- whilst a regular reinvestment service done on your behalf gets your portfolio into the habit of reinvesting -and you can reap those rewards! Costs are important but sometimes they can be a false economy if by going with a cheaper platform it means lower quality or more work on your behalf -I can recall being with people like Charles Stanley and Best invest and having to ring them up for them to manually pay out some cash on occasions because they did not provide a service to do that electronically under a certain thresehold-Bestinvest is a prime example of that and why I left! I like the idea of defaults to defeat our psychological weaknesses (as in “nudges”), but dividends are over-rated by private investors. See Dividends Don’t Matter. Cash is cash, wherever it comes from. There doesn’t seem to be anything I can get from HL that I can’t get from iWeb and YouInvest. Your mileage may vary. However as you say in your linked article “But the key thing to remember is that the growth comes from reinvesting the dividends rather than spending them”and ” So with dividends at around 3.5% pa, they make up close to half of recent returns, or more than a third historically”. That is very much my arguement why dividends are so important – the more you reinvest your dividends the more shares you have, the more shares you have, the higher the dividends =growth! In terms of HL, I would argue that what you get is a more personal level of customer service which you may not need or think it worth paying more for. I had looked at iWeb but was not sure of their business model – I think they charge you everytime you buy or sell a fund and from memory I think their dividend reinvestment charge is higher than HL’s (2% rather than 1% from memory?) and although they are probably cheaper overall, I do value what HL gives me- but each man and women to their own tastes!